Rubens was a prolific seventeenth-century Flemish and European painter, a master of the exuberant Baroque style that emphasized movement, color, and sensuality. He is well-known for his Counter-Reformation altarpieces, portraits, landscapes, and mythological and allegorical history paintings. In addition to running a large studio in Antwerp, popular with nobility and art collectors throughout Europe, Rubens was a classically-educated humanist scholar, art collector, and diplomat, knighted by both Philip IV, king of Spain, and Charles I, king of England. In Antwerp, Rubens received a humanist education, studying Latin and classical literature. By fourteen he began his artistic apprenticeship with the little-known Tobias Verhaegh and then studied under two of Antwerp’s leading painters, Adam van Noort (1561 – 1641) and Otto van Veen (1556 – 1629). He studied the woodcut works of Hans Holbein the Younger (1497 – 1543) and the engravings of Marcantonio (1480 – 1534), eventual becoming an independent master in the Guild of Saint Luke at Antwerp in 1598. Traveling to Italy, Rubens was influenced by the Venetian masters, Titian, Veronese and Tintoretto, before settling in Mantua as court painter for Vincenzo I of Gonzaga (1562 – 1612). He also saw Florence and Rome, seeing classical artworks, and the Renaissance masterworks of Michelangelo, Raphael and Leonardo da Vinci, as well as the Baroque art of Caravaggio. He also traveled to Spain for Gonzaga, visiting Philip II and seeing his collection of works by Raphael and Titian. The trip was artistic, painting an exquisite portrait of the Duke of Lerma (1552 – 1625), but also diplomatic on behalf of Gonzaga. He then returned to Italy, staying in Mantua, Genoa and Rome, where he painted the high altar for the Chiesa Nuova. 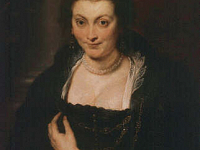 His stay in Italy was highly influential, so much so that Rubens adopted his signature of letters as Pietro Paolo Rubens. He then returned to Antwerp, which would prove gainful for an artist at a time of the Twelve Years Truce, through the treaty of Antwerp. He found a position as court painter for Albert, Archduke of Austria and his wife, Isabella; his house and studio in Antwerp is now the Rubenshuis Museum. During this period, Rubens taught some of his prominent pupil, Anthony van Dyck (1599 – 1641), collaborating with painters such as Frans Snyders (1579 – 1657), who assisted Rubens with his, Prometheus Bound, in 1612, as well as with Jan Brueghel the Elder (1568 – 1625), who painted floral in a number of Rubens works such as, Satyr viewing the Sleeping Nymph. His altarpieces in the Cathedral of Our Lady in Antwerp are also praised as exemplary Baroque religious art. Rubens began his famous Marie de’Medici Cycle, for the Queen of France in 1621, where he also painted his, Henri IV at the Battle of Ivry and Triumphal Entrance of Henri into Paris, King Henri IV of course was Marie de’Medici’s husband, works now in the Uffizi Gallery. It was at this time that the Twelve Year Truce ended and with this Ruben’s diplomatic activities increased, trying to form peace between the Spanish Netherlands and the Dutch Republic. This earned Rubens his Knighthoods in 1624 and again in 1630, also receiving an honorary Master of Arts degree from Cambridge University in 1629. While acting diplomat in Spain he befriended King Philip IV’s court painter, Diego Velazquez (1599 – 1660). 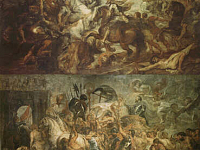 Rubens then returned to Antwerp, painting well up until his death in 1640. Rubens was a highly valued painter in his time, his own art collection quite valuable as well. He is also one of the most valued “Old Masters” in today’s art market. His legacy has garnered him the stylistic reference of “Rubenesque”, which describes a style of painting meaning plump and fleshy, ye not fat, figures, mostly towards women. 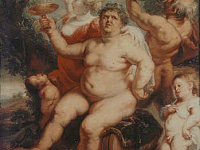 His other work in the Uffizi Gallery includes, Bacchus astride a Barrel.